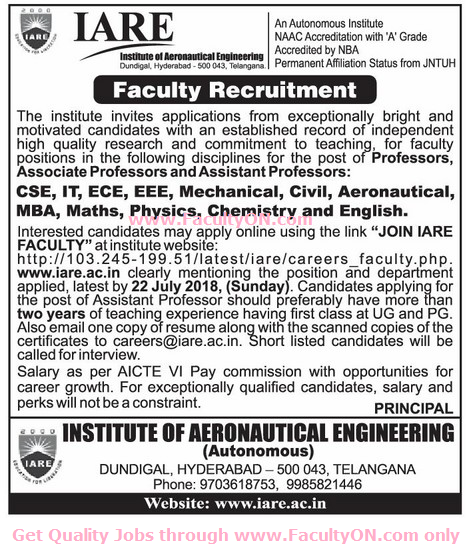 Institute of Aeronautical Engineering (IARE), Hyderabad has advertised in the EENADU newspaper for the recruitment of Professors / Associate Professors / Assistant Professors jobs vacancies. Interested and eligible job aspirants are requested to apply on or before 22nd July 2018. Check out further more details below. College Profile: Institute of Aeronautical Engineering is one of the Premier Educational Institutions dedicated to impart quality education, promoting academic pursuits in the field of Aeronautical, allied branches of Engineering & Management. IARE started in the year 2000 as an exclusive institute for providing quality education in the field of Aeronautical Engineering in the State. Since then, it has transformed itself into a truly integrated inter-disciplinary technological institute. How to Apply: Interested and eligible candidates are request to apply online at the official website and also send resume along with necessary scanned copies of documents and photo to the following Email address.